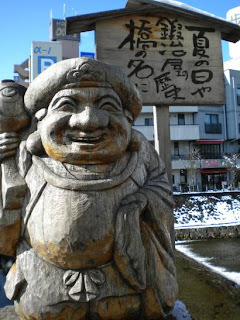 While there are plenty of opportunities to sample local fare throughout Takayama's charming Edo-era streets, it still tastes best at a local farmer's market stall. A bitterly cold morning found us crunching our way along snow-dusted roads in this mountain village northwest of Tokyo to check out the area's two morning markets. Despite temperatures well below freezing, vendors set up early to greet us with a great assortment of pickled vegetables, homemade misos, dried beans, apples sweet and sour and somewhere in between, as well as a few things I'd never imagined I could ever want to eat or cook with. Only a small handful of vendors braved the cold in front of Takayama Jinya, an Edo-period government building now a museum. Perfectly positioned to attract tourists moving between the museum and Takayama's famous old town area, the market must be just electric in warmer weather. Kunnocho's table offered a nice selection of their apples along with small jars of homemade applesauce. The two varieties on hand - Senofuji and Kountouku - had samples available, and subsequently one of each landed in my bag. 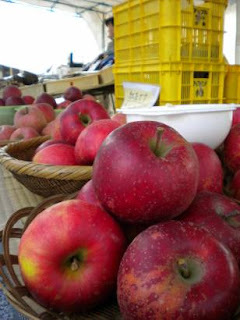 Senofuji's dusty red skin covered a pleasantly crunchy inside with apple flavor that wasn't too tart or too dull. Kountouku's bright red skin matched the tart burst of flavor that made me wish I could take enough home for pie (if I had an oven) or for jam. 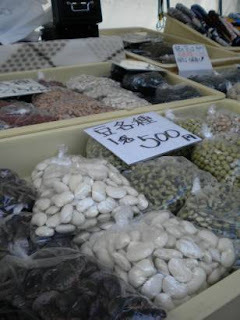 The table just next door offered zenmai (a dried mountain vegetable), yogoma (perilla seed), and about fifteen different varieties of dried beans: green (two kinds), murasaki hanamame (a big purple and black broad bean) sat next to its white counterpart, two kinds of green beans, two varieties of adzuki, kuromame (black soy beans) as well as the white variety, and three or four other kinds that reminded of pinto beans in their appearance. 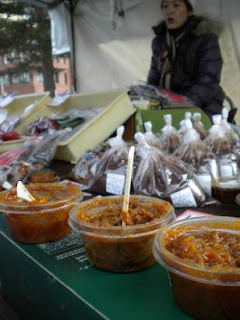 Each neatly measured and tied bag came with a card bearing the farms name and contact information as well as a recipe. Falling for it's pretty red and white appearance, I chose a bag of toramame for a souvenir. 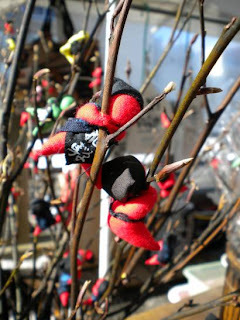 Bundled against the cold, Furusei-san offered an assortment of misos. Crafted from beans they grow themselves, her misos were a rich red-brown color and slightly sweet on the tongue. The real show-stopper, though were her ginger, togarashi (hot pepper), and garlic flavored misos. Rich and intense in flavor, I came away with a full set since I simply could not decide which I liked best. This market runs a narrow lane just next to the river. Stalls on one side and shops on the other gave shoppers ample opportunity to sample and talk while perusing wares on a bright cold morning. A similar selection of pickles and miso were available, but in addition there were yew wood-carvings and textiles along with food carts serving hot grilled mochi, steamed buns, and hot cups of tasty coffee. We also got to sample lots of Hoshigaki (dried kaki) that are a dream for a sweet tooth like me. Sugary and chewy, I could chomp my way through an entire box of these without batting an eyelash. Luckily, we didn't buy a box and my companions didn't allow me to loiter too long at any one stall. The most surprising item at this market though, were the dried, flat leaves of magnolia. We spotted them for sale at stalls and even pre-packaged in some of the shops, but couldn't quite figure out how they might be used until we spotted a sample at a nearby shop. 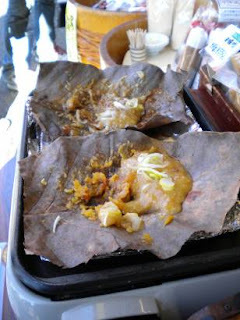 There on a small grill rested a leaf with miso smeared over the center. Thin, tender strips of Hida beef (another item Takayama is famous for) would normally be piled on top to slowly absorb the flavor of the leaf and the miso to make for what must be a mouth-watering dish. Similar in shape and size to the chestnut, the Japanese magnolia leaves look like they would cook up a nice sized portion, too. Another item I wish I would have snagged for a winter evening meal! The markets open at about 7am in winter, and we arrived close to 8:30am at the first one. It was plenty early for these cold days, although as the weather gradually warms I'd recommend coming closer to the start time to beat out the heaviest traffic and get the best selection. They also close up at 12pm sharp, so don't loiter anywhere else in town if you're hoping to visit. Takayama's tourist offices provide excellent maps of the city with markets, landmarks, and suggested walking courses clearly marked.